This Vitalize kit helps with many skin conditions such as dark spots, aging, pigmentation abnormalities and skin damaged by the sun. Kit includes, 1 bottle of Prepping Solution 30ml; 18 mixing cups; 6-4ml vials of Vitalize Peeling solution; 6-4ml vials of Vitalize Retinol Solution. SkinMedica Vitalize Peel helps fight the effects of time, sun damage, and environmental assaults. This powerful yet non-damaging peel can take years off aging skin. It addresses various skin conditions, such as pigmentation abnormalities, post-inflammatory hyperpigmentation, melasma, and photodamage. Achieve visible improvement after one treatment and significant results after a series of treatments with little to no downtime! Also, it can be customized for the treatment of each specific condition. This peeling solution is combined with Retinoic acid which creates more exfoliation than other chemical peels and is generally well tolerated. Peel resistant skin, meet your match. I peeled for 10 days. I have been doing peels for over 10 years. I have paid for Perfect Derma, Vi Peel, IpL, all types of TCA, phenol and glycolic to penetrate my melasma. NOTHING ever works. My skin details: Fitzpatrick IV, olive, 48, dermal melasma, hx of reactive hyperpigmentation. No wrinkles (♡ Botox), use SPF 50, wash with ROC wash discs and use Retin A micro 0.1% every 2 days. I am well exfoliated to say the least. I did 3 passes with this peel, with no frost but a good tingle. The next day I was tight. Day 3 a little flaky. On day 4 I noticed the really tough areas of melasma on my forehead seemed, well, crispy and were lifting off. I didn't think the rest of my face and neck were to peeling on day 5 butwhen I came home from work my face was a flaky mess under my makeup. I was pleasantly surprised. Day 6 the peeling worsened and even my earlobes were peeling. The instructions emphasize using petroleum at your eyes because the peel travels, I actually followed the instructions, and thank goodness. My hairline peeled for days, my ears, still peeling. I want to do my second peel but know know I need time off to not be a freak show at work. One peel from this box was worth the whole price for me. My forehead may really improve, after my third peel i will post photos. Arrived 11/17/17 with an expiration date of 05/2019. I've been using SkinMedica for years and these peels are amazing! About 3 years ago I did a series of 6 peels and it did wonders for my skin, better than 3 fraxel laser treatments.......A peel at my local dermedspa is $175 per peel so a package of 6 for $288.00 or $1050.00 for 6 at the dermedspa? Not even a close call. I will be purchasing these again. Thank you Overstock! I have been getting these peels at my plastic surgeons office for wayyy more than this pack of 6. I was really excited to find it on overstock because I didn’t want to pay that much money...it adds up quick when you need to do them every few months to maintain your results. I received my package with an expiration date of Oct 2019 so I will have plenty of time to use all 6 peels. I was a little scared to do this myself but it came with detailed instructions and to be extra safe I watched a couple videos on YouTube. I did my first peel last night and it was really easy. I wore rubber gloves, put Vaseline on the corner of my eyes and lips and used a fan to help with the burning sensation in between applications. For my first peel I only did 2 applications...you can do up to 3 if you have done peels before and your skin isn’t sensitive. Being my first time doing this myself, I didn’t want to do 3 applications. I did my peel last night and this morning when I woke up my face is a little itchy and slightly red in certain areas. This is as expected for day 1 post peel. I will continue to put on moisturizer all day so I don’t scratch my face. I expect to start peeling tomorrow. This is a great value and I highly recommend!! I was a bit skeptical on the authenticity of this product since it is only sold to certified estheticians. I am 48 years old with minimal wrinkles. I have smoker's lines above top lip, and some sun damage. My first Vitalize peel I had done at esthetician's office (11/1/18) I didn't peel much, & only noticed minimal changed in forhead lines. My 2nd appt I had a Rejuvenize Peel (strongest) & peeled quite a bit (12/14/18). Removed most of the sun damage & noticed a slight change in fine lines under eyes. I did one of these peels (12/27/18, & feeling confident doing myself after having professionally done & watched many videos of it being applied). THIS IS THE REAL DEAL. You have to be realistic with the outcome of each peel. It's a process of exfoliating off layers of skin. It WILL NOT REMOVE wrinkles, but will minimize with each peel, sometimes unnoticably. Patience is a virtue. I was paying $200-$249 PER peel professionally done. $50/peel with this. My skin is brighter, smoother. The only way to remove wrinkles is through surgery or injectable fillers. Peeling resembles a sun-burn peel using this product. I would recommend this peel to first timers. Instructions are very clear, even for beginners. Will definitely buy this kit again & again. Clinically, I have used these peels before with fantastic results! Unfortunately,my order was not delivered to my address :( I opted for a less expensive peel with great disappointment :(. My next skin care order I will stick to this beautiful ,predictable peel! Plan to peel by the 3rd day. We perform these for 225/peel where I work. SkinMedica will provide noticeable results!! When I am finished with the other peels I ordered, I will order SkinMedica's Vitalize Peel for overall clarity, youthful appearance and lessen hyper pigmentation (aka - dark spots/sun damage). Gentle peeling and it's working! I have never had a chemical peel before but a friend has been doing them for 5 years and looks 10 years younger. She uses the SkinMedica Rejuvenize but I could not find that online. 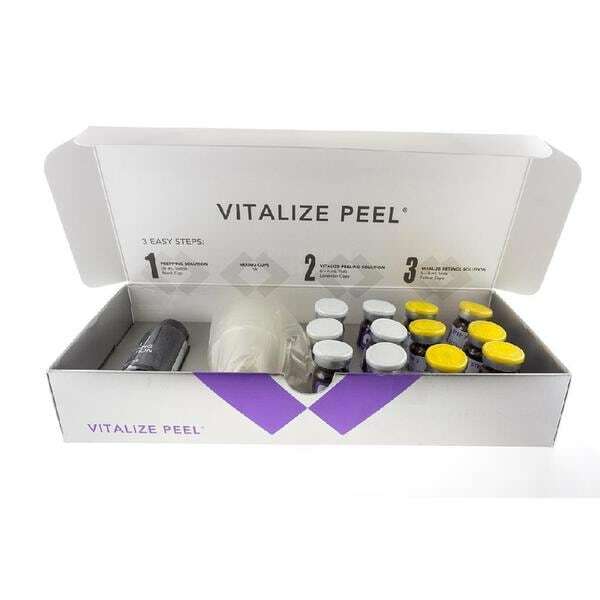 This Vitalize is a less concentrated peel. I figured what am I waiting for. Time to address all the sun damage and brown spots from my teenage sunbathing with oil and reflectors. I have completed 4 of the peels. I didn't see much peeling with the first application. But with the second and third peels, I had a lot of flaking. I am still able to wear makeup, go to work, no one stares as me. And I have had two people say to me "Hey, you look good, what has changed?" What I can see is that my face is brighter, the peel is lightening the brown spots and my overall complexion. really it is . I've just done the 4th application and I'm waiting for the skin flaking to occur. It seems to take place on Day 6 following the application. I did it on Monday and it's Friday now and I haven't seen the flaking yet. I wear Vanicream to keep my face moisturized when I am at home. When I go out, I use Neutrogena SPF 50 under my makeup or with a naked face. I used it on my neck and collarbone this time so we'll see how that goes. It's easy to apply and I'm able to get three passes over my face with one application. I make sure to wait a good 5 minutes between passes just to give everything a chance to soak in. The Kit gives you 6 applications at approx *** ea. It is worth it. I am a physician, and am aware that the typical charge per vitalize skin peel by a skin care professional is $150.00 to $200.00. This kit contains enough for 6 peels therefore valued at $900.00 to $1200.00. This is a very significant savings! This peel is safe and effective to do at home. The results are striking and strikingly noticeable within days. Instructions enclosed with the kit are thorough and easy-to-follow. Why go to Dr. office when identical and much less expensive results can be reliably achieved at home? O.M.G. I have spent thousand getting this peel done at my dermatologist and medspas. The application is rather simple so I felt comfortable buying this and trying it at home myself for a fraction of the price. This week, I completed my second peel from this order and I am so happy I bought this. It works well and I can now save money and care for my acne prone skin at home for much less. The kit has everything you need to complete the peel and it is definitely the real deal. So happy Overstock sells this. I plan to buy more so that I can maintain the amazing results. This is the second time that I’ve bought the SkinMedica Vitalize peel kit from Overstock. It works just as well for my skin and is the exact same product at my local skin care and wellness office. Much cheaper to buy it here and easier to do at home. No down time and makes my skin look radiant. Great product - authentic (I am an avid in-office chemical peeler and have had numerous vitalize and rejuvenize peels... these are legit and mine have a 2018 expiration... I am currently several days into my peel). I am totally buying more six packs from Overstock!!!! I have been executing the peels about every six weeks and it makes my skin smoother and I believe it allows my other expensive skin products to penetrate better. I have been doing these treatments in my dermatologist office for a few years. The cost of this set of 6 equals the cost of one treatment at the dermatologist office. Great savings and arrived delivered and in tact! Best peel on the market!!!! i have used this 3x so far. it is exactly like the professional product. about the 3rd day, you start peeling and it continues for a couple of days until everything is peeled. my skin has a glow effect after using. Perfection! The absolutely best peel! Works just like the one in my dermatologist’s office. I am so happy I found it at overstock. The panflet that comes with it explains in detail how to apply. You will start peeling in 36-48h. The product worked as advertised. I followed the directions exactly and I was happy with the results. I would recommend it. Best price ever and an expiration date well beyond a year. "Is this safe to use on neck and chest area?" I would stick to face only. "I have done this peel now twice. I have seen no results and have not peeled at all. Could it be fake?" "Hi! What is the expiration date on the current peels you are selling? Thanks." "What are the list if ingredients? Does it includes paraben?" The prepping solution contains: Isopropyl Alcohol, Water/Aqua/Eau, Acetone. The peeling solution contains: Alcohol Denat., Salicyclic Acid, Resorcinol, Lactic Acid, Panthenol, Isoceteth-20. The retinol solution contains: Alcohol Denat., Retinol. "How often can you use?" You can use these peels every 4-6 weeks. I usually do mine once a month. For the best results, do one peel a month for three month in a row. We would not recommend using this more than once a month. "What's the expiration date on this kit?" I believe that every kit has a different expiration date. My kit arrived November 2017 with an expiration date of May 2019. More than enough time to use all 6 peels and come back for more! "I am starting my peels next week. What's best to use after while your skin is peeling?" After the peel, you should use a basic cleanser and also a sunscreen. Do not use any products such as Retinol right after.